You’re planning a major construction project. Geotechnical analysis tells you that groundwater intrusion threatens the stability of your excavations. You need a dewatering expert with the know-how and resources to get it right. Griffin Dewatering is the largest dedicated contract dewatering company in the U.S. We manufacture equipment and install dewatering systems for the most complex groundwater challenges in the construction industry. From engineering design to system installation to filtration and treatment of discharge water, we have the expertise and equipment to keep your excavation safe, dry and on schedule. 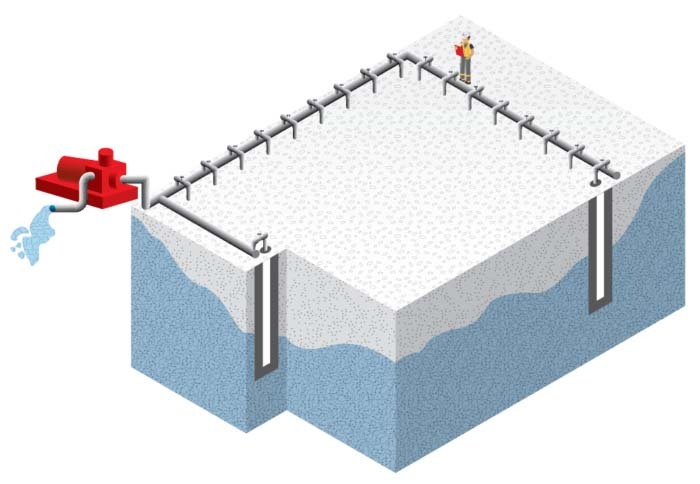 The best dewatering solution depends on factors that are unique to every site — everything from soil permeability to stratification. Beneath the surface, the hydrogeology at a construction site may be infinitely complicated. Any excavation will eventually fill with groundwater. How much and how fast depends on the soil type and the height of the water table. Griffin engineers analyze soil types and model groundwater flows to design the most efficient pumping systems. It’s all too easy to get out of your depth. During system installation, you may encounter conditions that will force you to change your engineering designs. Then there’s the question of what to do with the water you remove. The presence of natural or man-made contaminants, such as arsenic or toxic metals, may demand a discharge treatment solution to comply with federal, state, and local statutory requirements. Soil type and permeability, groundwater and excavation depth, contamination risks—any miscalculation on these variables can quickly cascade into bigger problems, putting your project severely behind schedule and over budget. It’s important to remember that when you remove groundwater, you change the makeup of the soil. This can cause geological instability. Improperly designed dewatering solutions can result in unwanted subsidence, erosion, or flooding. Don’t risk putting your project—or your company—in jeopardy. Whatever your project or budget parameters, Griffin has the expertise and the solutions to meet your needs. © 2018 Griffin Dewatering Corporation. All Right Reserved.